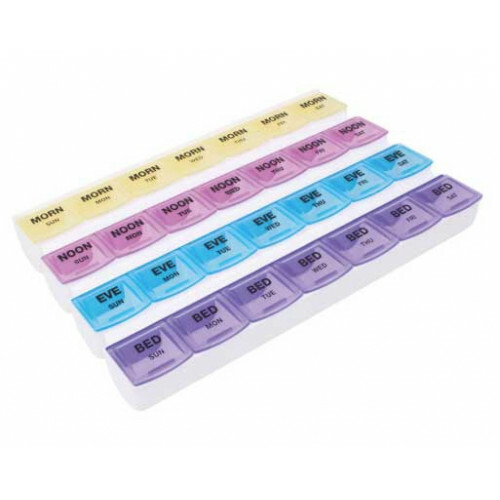 7-Day Mediplanner by Carex offers effective, straight-forward organization for your daily pill regimen in a four-times-a-day, color-coded pill container. The 7-Day Mediplanner can be placed on your counter or within a drawer for easy access to your medications. The lids open easily, yet stay securely closed to keep your pills in place. 7-Day Mediplanner features a contoured design for easy pill removal, as well as see-through lids for easy medication viewing. The color-coded compartments help keep each does straight, offering up to four times per day medication planning, from morning to bed time. Securely Holds Pills and Vitamins to Help Maintain a 4-Times a Day Regimen. Contoured Design For Easy Pill Removal. 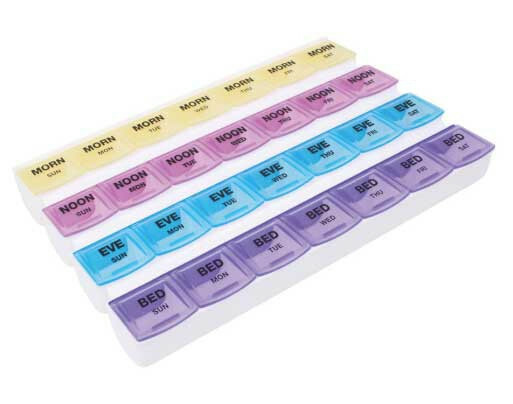 Color Coded Compartments For Up to Four Times Per Day Medication Planning.